A voracious predator has stormed over Northwest apple and pear orchards over the last few years, leaving crooked and oozing branches that require orchardists to sever limbs and sometimes whole trees. Fire blight has plagued fruit trees for years, but weather conditions have worsened the severity of infestations from the bacteria since 2015. 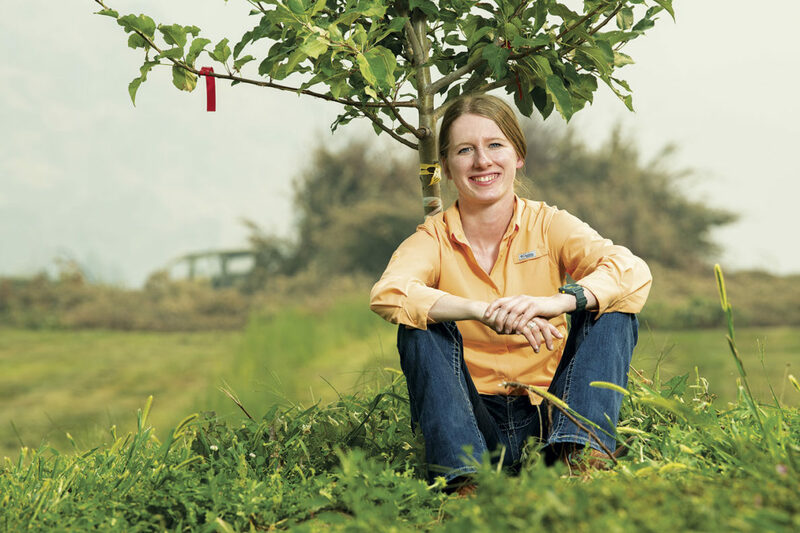 Sarah Kostick, a horticulture doctoral student at Washington State University, is tackling the disease that costs apple growers millions of dollars every year. Working in WSU apple breeder Kate Evan’s program at the Wenatchee-based Tree Fruit Research and Extension Center, Kostick is experimenting with hundreds of apple cultivars in the search for genetic resistance to the bacterial disease. Kostick says fire blight strikes younger trees harder than older trees. Many newer varieties are also more susceptible than older varieties like Red Delicious. “We need new apple cultivars that resist fire blight but keep that high fruit quality,” she says. She spent the last two years inoculating more than 1,600 trees with the bacteria. Dipping scissors in a suspension of fire blight pathogen, she cut the tips of shoots on young trees, then measured the resulting infection. Kostick is now analyzing the results to find areas of the genome that are associated with resistance to the disease. Meanwhile, WSU Extension specialists have worked with orchardists for years to manage fire blight. One key fire blight management tool developed over the last 20 years by Extension specialist emeritus Tim Smith is “CougarBlight,” which incorporates temperature and moisture data from WSU’s AgWeatherNet to predict infection risk during bloom. Growers use the WSU Decision Aid website to find information on their risks at any given time, as well as projections for the following week, says DuPont. Many growers use the CougarBlight model to determine when, where, and how to spray most efficiently. There are also tools for organic orchardists. In concert with Oregon State University over the last 15 years, Extension developed integrated non-antibiotic management strategies. Growers can use a yeast to guard the flowers in early bloom, followed with either biological controls or a soluble copper. “Every year we test 20–40 new products and we hope to find more tools to make fire blight management easier for growers,” DuPont says. All of the fruit tree industry, and WSU researchers and specialists, hope for a cool, dry spring to reduce the fire blight risk. But the race to find resistant cultivars and products to manage the disease is just gaining speed.